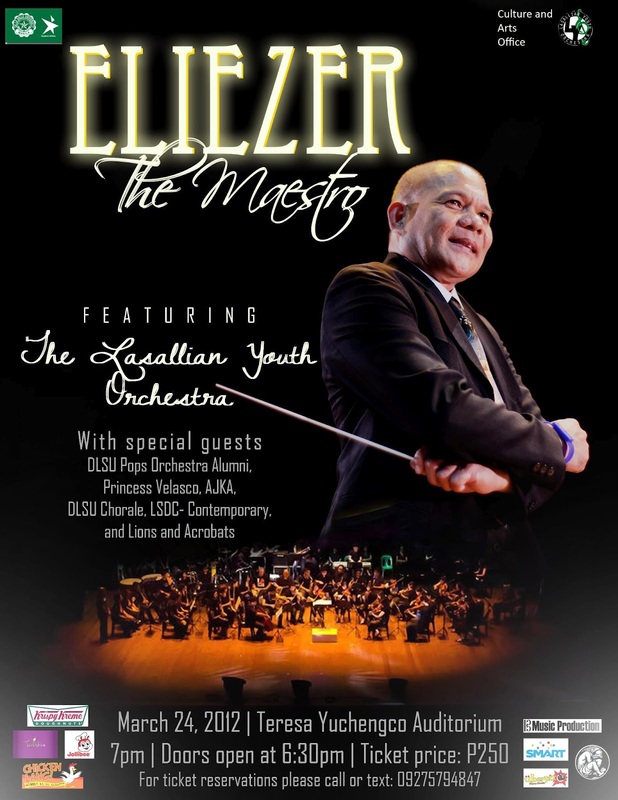 The Lasallian Youth Orchestra presents a centennial concert entitled, "Eliezer: The Maestro" on March 24, 2012, 7pm at Teresa Yuchengco Auditorium in De La Salle University, Manila. Maestro Eliezer San Felipe has been the conductor of the orchestra for 28 years now, from its humble beginnings as the DLSU Concert Band, that eventually became the DLSU Pops Orchestra, and now known as the Lasallian Youth Orchestra. This will be San Felipe's final concert conducting for the group's orchestra, as they will play rock-pop-funk-classical-retro music. Lasallian Youth Orchestra - "Sweet Child O' Mine"
Tickets: P250 only. Discounts apply for bulk purchases. For ticket reservations, please contact Genji Saclolo at +63.927.5794847. DLS-College of St. Benilde (CSB) students can contact Moku Garcia at +63.917.8550524 for ticket inquiries.